Thromboxane A2 (TXA2) is a type of thromboxane that is produced by activated platelets during hemostasis and has prothrombotic properties: it stimulates activation of new platelets as well as increases platelet aggregation. This is achieved by activating the thromboxane receptor, which results in platelet-shape change, inside-out activation of integrins, and degranulation. Circulating fibrinogen binds these receptors on adjacent platelets, further strengthening the clot. Thromboxane A2 is also a known vasoconstrictor and is especially important during tissue injury and inflammation. It is also regarded as responsible for Prinzmetal's angina. Receptors that mediate TXA2 actions are thromboxane A2 receptors. The human TXA2 receptor (TP) is a typical G protein-coupled receptor (GPCR) with seven transmembrane segments. In humans, two TP receptor splice variants – TPα and TPβ – have so far been cloned. TXA2 is generated from prostaglandin H2 by thromboxane-A synthase in a metabolic reaction which generates approximately equal amounts of 12-Hydroxyheptadecatrienoic acid (12-HHT). Aspirin irreversibly inhibits platelet cyclooxygenase 1 preventing the formation of prostaglandin H2, and therefore thromboxane A2. TXA2 is very unstable in aqueous solution, since it is hydrolyzed within about 30 seconds to the biologically inactive thromboxane B2. 12-HHT, while once thought to be an inactive byproduct of TXA2 synthesis, has recently been shown to have a range of potentially important actions, some of which relate to the actions of TXA2 (see 12-Hydroxyheptadecatrienoic acid). Due to its very short half life, TXA2 primarily functions as an autocrine or paracrine mediator in the nearby tissues surrounding its site of production. Most work in the field of TXA2 is done instead with synthetic analogs such as U46619 and I-BOP. In human studies, 11-dehydrothromboxane B2 levels are used to indirectly measure TXA2 production. ^ Offermanns, Stefan (2006-12-08). "Activation of Platelet Function Through G Protein–Coupled Receptors". Circulation Research. 99 (12): 1293–1304. doi:10.1161/01.res.0000251742.71301.16. ISSN 0009-7330. ^ Ding, Xueqin; Murray, Paul A. (November 2005). "Cellular mechanisms of thromboxane A2-mediated contraction in pulmonary veins". American Journal of Physiology. 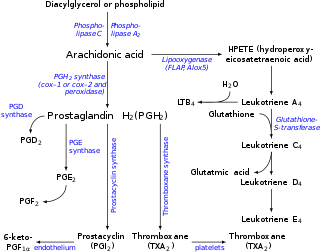 Lung Cellular and Molecular Physiology. 289 (5): L825–833. doi:10.1152/ajplung.00177.2005. ISSN 1040-0605. PMID 15964897. ^ Yamamoto, K.; Ebina, S.; Nakanishi, H.; Nakahata, N. (November 1995). "Thromboxane A2 receptor-mediated signal transduction in rabbit aortic smooth muscle cells". General Pharmacology. 26 (7): 1489–1498. doi:10.1016/0306-3623(95)00025-9. ISSN 0306-3623. PMID 8690235. ^ Smyth, Emer M (2010-04-01). "Thromboxane and the thromboxane receptor in cardiovascular disease". Clinical lipidology. 5 (2): 209–219. doi:10.2217/CLP.10.11. ISSN 1758-4299. PMC 2882156. PMID 20543887. ^ Winn, R; Harlan, J; Nadir, B; Harker, L; Hildebrandt, J (September 1983). "Thromboxane A2 mediates lung vasoconstriction but not permeability after endotoxin". Journal of Clinical Investigation. 72 (3): 911–918. doi:10.1172/jci111062. ISSN 0021-9738. PMC 1129256. PMID 6886010. ^ Yokomizo, T. (2014). "Two distinct leukotriene B4 receptors, BLT1 and BLT2". Journal of Biochemistry. 157: 65–71. doi:10.1093/jb/mvu078. ^ Michael P. Walsh; et al. "Thromboxane A2-induced contraction of rat caudal arterial smooth muscle involves activation of Ca2+ entry and Ca2+sensitization: Rho-associated kinase-mediated phosphorylation of MYPT1 at Thr-855 but not Thr-697" (PDF). Archived from the original (PDF) on 2011-07-13. ^ Catella F, Healy D, Lawson JA, FitzGerald GA (1986). "11-Dehydrothromboxane B2: a quantitative index of thromboxane A2 formation in the human circulation". PNAS. 83 (16): 5861–5865. doi:10.1073/pnas.83.16.5861. PMC 386396. PMID 3461463. ^ Lordkipanidzé M, Pharand C, Schampaert E, Turgeon J, Palisaitis DA, Diodati JG (2007). "A comparison of six major platelet function tests to determine the prevalence of aspirin resistance in patients with stable coronary artery disease". Eur Heart J. 28 (14): 1702–1708. doi:10.1093/eurheartj/ehm226. PMID 17569678.